Neither Moscow nor St. Petersburg ever convinced you to travel to Russia. The 2014 Winter Olympics in Sochi and the upcoming 2018 FIFA World Cup didn’t either. But here you are. What finally tipped the scales in favor of a country about which you’ve been so hesitant? You’re in Russia because of Mount Elbrus. Specifically, you’re here because of a design lodge that’s perched on the side of Europe’s highest mountain. LEAPrus 3912 Alpine Station is more of a base camp than a hotel. It’s one of the most impressive base camps in the world, though. The station sits more than 13,000 feet above sea level—making altitude sickness a real threat—on one of the mountain’s southern glaciers. It takes two enclosed ski lifts, plus a snowmobile ride, to reach it. The views are completely worth it. Mount Elbrus is a dormant volcano in the Caucasus Mountains of Southern Russia. It’s just miles from the Georgia border. The mountain has two summits. The eastern summit, which stands at 18,442 feet, was first ascended by an Imperial Russian Army scientific expedition in 1829. The taller western summit was reached 45 years later by a British expedition. 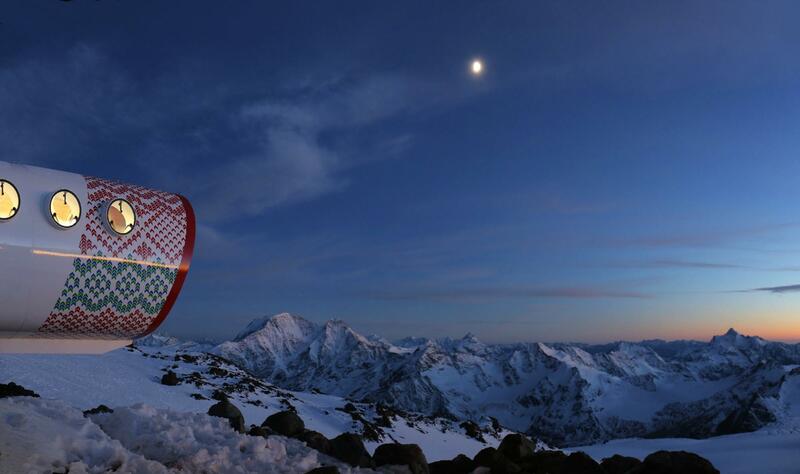 Despite its height, Mount Elbrus is now considered one of the easiest high-peak climbs in Europe due to cable lifts and cabins that have been built on the mountain. LEAPrus 3912 Alpine Station is one of the newest cabins. LEAPrus 3912 Alpine Station is comprised of four prefabricated, fiberglass buildings that were created by Italian architects and airlifted into place. Two of the buildings have communal bedrooms and lounges. There are bunk beds for 49 hikers. Another building is reserved as the restaurant and the staff quarters. While the smaller fourth building holds the bathrooms (picture upgraded airplane facilities). The accommodations aren’t luxurious, but they’re clean, comfortable, and eco-friendly. Plus they overlook volcanic peaks perpetually capped with snow. So once you see this sleek station built into the side of Mount Elbrus, it won’t really matter what country you’re standing in.